ST. PETERSBURG, Fla. -- As Carl Crawford raced toward home plate, with Jorge Cantu at bat and Jason Johnson coming out of his windup, a most alarming thought entered his mind: ``Cantu, he's aggressive at the plate. I better get in there quick before something bad happens." Crawford, so quick, nearly beat Johnson's pitch to the plate. In fact, he covered the requisite 90 feet so rapidly that he nearly ran into another alarming possibility that his teammates later made him aware of. ``They told me," Crawford said, beaming, ``I almost got hit by the pitch." Crawford's outright steal of home, a feat last accomplished against the Red Sox by Omar Vizquel in 2000, was the last indignity endured by Johnson. The stolen base, which allowed Crawford to steal for the cycle (he swiped third in the second inning and second and home in the fourth), accounted for Tampa Bay's fifth run in a 5-2 Sox loss before the smallest crowd the team has played before this season (15,001). In 14 starts with the Indians, Johnson was 3-8 with a 5.96 ERA and was hit at an unsettling .371 clip. In two starts with the Sox (June 30 at Florida and last night) he's lasted four innings each time out . His total line: 8 IP, 13 H, 10 R, 9 ER, 6 BBs, 5 Ks. That's an 0-2 record and a 10.13 ERA. Johnson was roughed up early. He allowed 11 base runners and needed 70 pitches to get through three innings, after which the Sox trailed, 4-1, though it easily could have more, for the Devil Rays left six men on base in that span and left the bases loaded in the third. ``I don't know," Johnson said, when asked the source of his struggles. ``I'm going to have to get through it. There's no other way around it. I've given up runs early my last two starts. It's tough to come back on that. It's something I'm going to have to cure myself of, somehow, some way." The Sox did little to help him, managing just four hits off converted reliever Tim Corcoran (6 2/3 IP, 4 H, 2 ER) and three relievers. Corcoran worked out of the stretch the whole night and did so effectively, limiting the Sox to Jason Varitek's solo homer in the second (No. 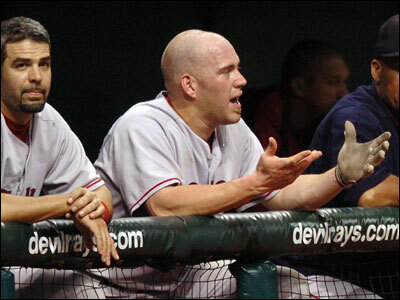 9 of the season) and Kevin Youkilis's fifth-inning sacrifice fly. In fact, it was rather ironic that not a single member of the Tampa Bay pitching staff threw a pitch out of the windup, while Johnson, with Crawford on third in the fourth inning, elected to pitch out of the windup, despite Crawford's wicked speed. Crawford said he'd never stolen home at any level (``Too afraid of getting hit by the bat," he said). But Tuesday he noticed Curt Schilling pitching out of the windup while he was on third, and he began counting off his steps, plotting a steal of home. ``[Tuesday] I timed it and felt if I got enough of a lead I could sneak in there," he said. ``[Last night] I was surprised to see them try it again because [Tuesday] I got a big lead. It made Schilling go to the stretch. [Last night] I saw it, it made me think, `They don't care, so I'll go.' "
Johnson said he never saw Crawford measuring his steps. Still, why go out of the windup, after pitching from the stretch in a similar situation earlier in the game? ``At the time I felt comfortable throwing out of the windup," Johnson said. ``It was obviously something he thought about. I chose the wrong thing." Terry Francona's opinion: ``The premium is on getting the hitter, so we're going to let him pitch the way he's more effective." The manager paused and added, ``That's a tough thing to watch." The last three games have been tough on Sox' eyes. They've lost all three and are in danger of being swept in a four-game series, despite coming in here winners of 14 of 15. They were two-hit Monday and four-hit last night. On top of the lack of offense there was frustration. In the third inning, with Alex Cora (three times on base in three plate appearances) aboard, Youkilis hit a ball high to left. It caromed off a catwalk that is in play and was caught by Crawford. Both Crawford and Tampa Bay manager Joe Maddon thought the ball would have landed fair, 10 to 15 feet shy of the wall. Francona, though, was rather peeved, especially since he saw David Ortiz lose a home run in Minnesota last month when a booming blast headed for the upper deck caromed off a speaker for a single. ``Same thing with Minnesota, off the bat I'm kind of hoping maybe that ball stays fair because I thought it had a shot to go out," Francona said. ``Seeing it bouncing around, at some point -- I don't think my complaining is going to do it -- but at some point Major League Baseball has got to [do something]. ``This putt-putt golf [stuff] has got to go. It's stupid. Hitting it around the windmill. This is a major league game. The bigger and stronger you are, the farther you hit the ball, it doesn't seem right. You get penalized." Said Maddon: ``Our ballpark kind of promotes strange occurrences. That's why we should play better here, because we should know this place better than other teams."